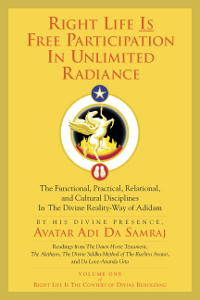 A sublime compilation of Avatar Adi Da’s essential Communications on the foundation principle of "radical" devotion in the Reality-Way of Adidam. Essays include updated sutras from the forthcoming final (and significantly expanded) edition of The Dawn Horse Testament, readings from The Aletheon, and never-before-published Discourse material from 1998, 2004, and 2005. 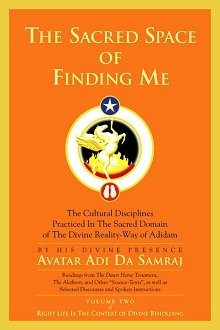 Avatar Adi Da describes in great detail the “seed” of the Reality-Way of Adidam: devotional recognition of His intrinsically egoless State. He further describes how this seed of tacit recognition (and not belief) is the means by which the devotee Communes with His Eternal Divine State via the responsive turning of the faculties (of body, emotion, mind, and breath) to His Divine Presence. Recognition of Me Is Liberation is part of a five-book series of core Instruction on the foundation practice established in the Second Congregation of Adidam. 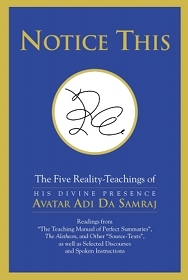 The first four books cover "radical" devotion and right life, while the final book, Notice This, is a depthful contemplation of "Perfect Knowledge".